My Answer: Sure, just ask a child who is bored to go do anything of love and good works. That bored child’s answer usually starts with, “No way,” or, “Do I have to?” And there will be a whine in their voice. If that is not the devil, what is? If you give them a treat that satisfies their lusts, then they are all over it. But in the presence of the Lord is fullness of joy. 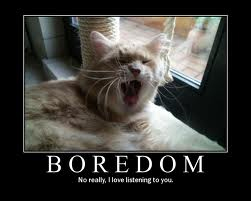 So how does boredom look compared to that? So boredom is an example the corruption of deceitful lust. So who do you know that is bored and needs the gift of zoe life in Jesus? Do the right things and you will get the right results; do anything different and you will be unhappy sooner or later. Digital Universe. There are no wrong answers here, only seek more of Jesus who already paid for every failure we ever made, are making now, or will make. Since He was healed of it, so are you.